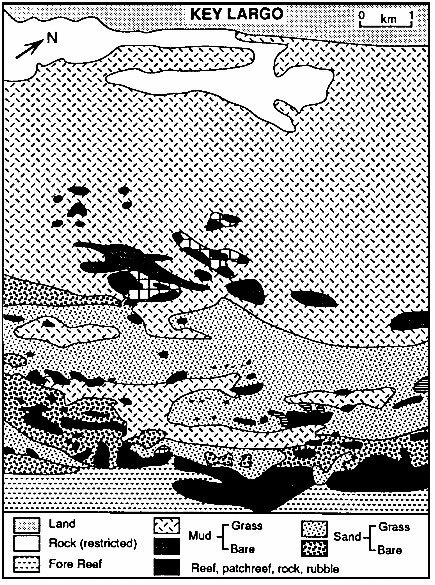 Deep water shelves (lagoons with water depths < 30m) are floored by muds. Thalassia banks grow on inner shelf, while patch reefs and mobile sands are on the outer shelf. In the following examples the difference in water depth has a significant impact on the lithofacies. 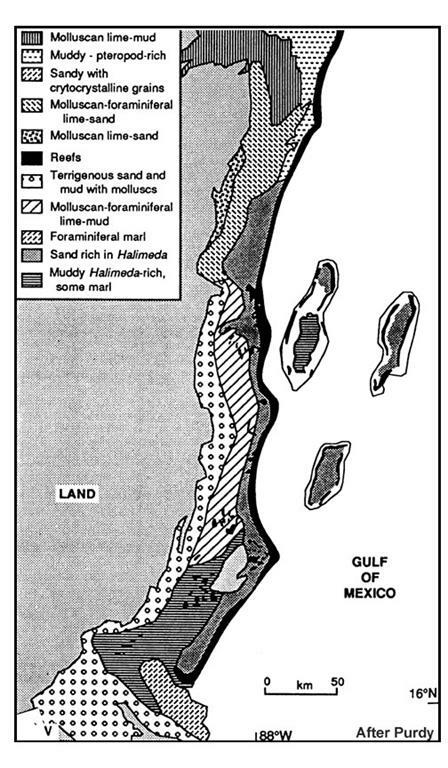 The Florida shelf is reaches a depth of about 20m, where it is covered by biogenic carbonate sediments with mud composed of Halimeda and Penicilius. The high-energy outer shelf is composed of Pleistocene limestone of rippled sand while the inner shelf is made up of fine grained sediments inhabited by Thalassia, Halimeda, molluscs, coralline algae, echniods, and small corals. With all of these organisms present, bioturbation is taking place and homogenizing the sediment. The Belize shelf is up to 60m deep. Its sedimentation is controlled by water depth and salinity due to the barrier reef's restriction of circulation. The facies include an inshore siliclastic belt of quartzose sand (originally Pleistocene deposits), a shelf lagoon mantled by siliclastic and carbonate sediments and the floor blanketed with montmorillonitic mud, and a central lagoon with reefs and atolls on its shelf. General trends include an increase in carbonate content from the shore to the barrier reef (west-east), and a change in bioclast composition as water depth increases from molluscs and foraminifera to Halimeda to Gypsina (north-south). The complex set of facies are made up of rims, reefs, or oolitic grainstone shoals that parallel the shoreline.